This publication presents guidelines on the first steps for implementing biodiversity conservation measures within PCAs. Within the Alps - a globally important ecoregion for biodiversity conservation - WWF identified 24 Priority Conservation Areas (PCAs) where conservation activities need to be concentrated. This publication presents guidelines on the first steps for implementing biodiversity conservation measures within PCAs. Standard procedures for the assessment of biodiversity in PCAs in the Alps were identified based on lessons learned in the pilot projects carried out by the WWF European Alpine Programme (EALP), together with WWF Italy and WWF Switzerland. Such standards can be used as guidelines by each National Organization (NO) in assessing biodiversity in their PCAs. 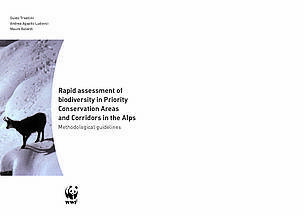 Rapid Biodiversity Assessment report for the Alps ecoregion.